Lyme disease is caused by an infection with the bacteria Borrelia burgdorferi, spread to humans by black-legged “deer” ticks. When Lyme disease is accurately diagnosed and properly treated patients often recover completely. However, some individuals experience long-term, debilitating effects, even after completing standard treatment. Some people who are sick with Lyme disease may have other tick-borne diseases. According to the Vermont Department of Health, Bartonella, Babesia, Anaplasmosis, Powassan virus, Erlichiosis, and other tick-borne pathogens have been found in Vermont. While “Lyme disease” usually refers specifically to an infection with Borrelia burgdorferi, the term is sometimes used to describe a tick-borne illness involving multiple pathogens. Tick-borne diseases can affect the skin, heart, nervous system and joints. They can appear in unique ways and mimic other diseases or disorders including heart conditions, Anxiety, Bi-polar disorder, Multiple sclerosis, Fibromyalgia, Chronic fatigue syndrome, Depression, and more. When tick-borne disease symptoms do not resolve after treatment it can be called “Chronic Lyme.” There is controversy about whether these ongoing symptoms represent a chronic infection, or an ongoing immune response. The CDC refers to this condition as “Post-Treatment Lyme Disease Syndrome” (PTLDS). Vermont has been consistently #1 or #2 in the U.S. for per-capita Lyme disease infections, and the rate of tick-borne diseases in Vermont is increasing. Because of the way Borrelia burgdorferi (Bb) act within the body, antibodies may not always be present in the bloodstream. According to the CDC, “During the first few weeks of infection, such as when a patient has an erythema migrans rash, the test is expected to be negative” The CDC also states, “Some people who receive antibiotics early in disease (within the first few weeks after tick bite) may not develop antibodies, or may only develop them at levels too low to be detected by the test.” People with late-stage, disseminated Lyme disease may also test negative. False positive tests do occur, and accurate tests for other tick-borne diseases may not be available. According to the CDC, a diagnosis of Lyme disease should be based on symptoms, and potential exposure to ticks. A negative blood test for Lyme disease does not necessarily mean you are free from infection. If you have signs and symptoms of Lyme disease you may be infected, even if a blood test is negative. You may also have a tick-borne disease that is not Lyme disease. Estimates from the CDC show one in four people who have Lyme disease do not see a rash. In a 2014 survey of confirmed Lyme cases in Vermont, a rash occurred in less than half of pediatric Lyme infections. In 2016, the Vermont Department of Health reported cases of confirmed Lyme disease without EM rashes have been steadily increasing in Vermont. The absence of a rash does not mean you do not have Lyme disease, and other tick-borne diseases do not present with a rash. Meet up with other Vermonters in your area affected by Lyme and tick-borne diseases. Learn more about the different treatment options and resources available in Vermont. 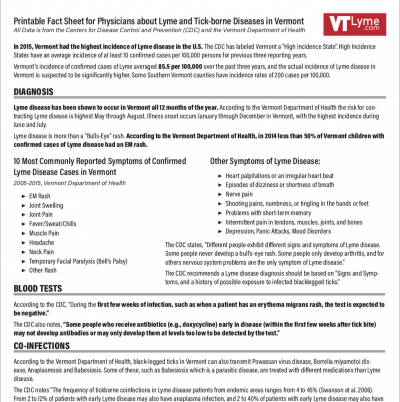 Our Mission at VTLyme.org is to provide equitable information, prevention education, and support for Vermonters affected by Lyme and other tick-borne diseases. Educate Vermonters about the prevention of tick-borne diseases, and the wide-ranging symptoms of tick-borne illnesses. Provide Vermonters access to accurate and updated information about the diagnosis and treatment of tick-borne diseases. Encourage Vermont medical providers to gain knowledge and expertise in the diagnosis and treatment of Lyme and other tick-borne diseases. Provide dependable support and resources for individuals and families in Vermont affected by Lyme and tick-borne diseases. This site is created for Vermonters who are concerned about, or affected by, tick-borne disease. It can be difficult to find accurate, unbiased information about diagnosis and treatment online, especially when looking for information and resources specific to Vermont. VTLyme.org does not provide medical advice. Use of this site is for information only. Please consult your medical provider before making any decisions about diagnosis or treatment.